Welcome to the official website for Darklore, a journal of exceptional observations, hidden history, the paranormal and esoteric science. Bringing together some of the top researchers and writers on topics from outside of mainstream science and history, Darklore will challenge your preconceptions by revealing the strange dimensions veiled by consensus reality. Contributors include Alan Moore, Robert Bauval, Daniel Pinchbeck, Loren Coleman, Nick Redfern, Robert Schoch, Blair Blake, Michael Grosso, Paul Devereux, Stephen Braude, Mike Jay, Lynn Picknett & Clive Prince and many others. Darklore offers only the best writing and research from the most respected individuals in their fields. 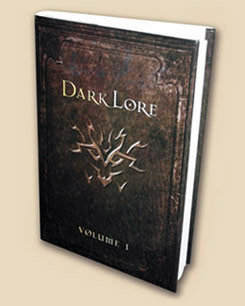 Our latest release is Darklore Volume 10, in which you'll find discussions of the controversy over the age of the Great Sphinx and the discovery of a secret underground chamber nearby, ways in which we could transmit a message to the survivors of a future apocalypse, alchemical texts and the out-of-body experience, the life of Fortean trickster Gray Barker, and much more. What are you waiting for, get your copy now from Amazon US or Amazon UK. We are pleased to offer three sample articles from Darklore Volume 10, as examples of the quality writing and layout inside the book - simply click on each graphic to download the PDF file. The first is "The Lost Children of Hamelin", in which Maria J. Pérez Cuervo explores the real history behind the legend of the Pied Piper. The second sample article, "Uncovering the Lost Tomb of Osiris", offers Ray Grasse's first-hand account of a mysterious discovery beneath the Giza plateau in Egypt. And lastly we have Greg Taylor's article "God is my Rock", in which he asks whether meteorites were the first gods worshipped by the ancients. These three sample articles offer just a taste of what you'll find in the print issue of Darklore Volume 10, so pick yourself up a copy to see the rest. Get your copy now for a great read, and help support quality writing and research in the alternative genre. "The History and Practice of English Magic", by John Reppion. "The Most Important Man on the Planet", by Adam Gorightly. "Rocks in Your Head", by Greg Taylor. "Believing in Fiction", by Ian 'Cat' Vincent. "A Social History of Ball Lightning", by Martin Shough. "The Dying Light", by Greg Taylor. "Mushrooms in Wonderland", by Mike Jay. "From Operation Mindf**k to The White Room", by John Higgs. "The Uninvited", by Greg Taylor. "The Slenderman", by Ian 'Cat' Vincent. "The God with the Upraised Arm", by Greg Taylor. "Anthropology of the Weird", by Jack Hunter. "How Martin Gardner Bamboozled the Skeptics", by Greg Taylor. "Return of the Flying Saucers", by Martin Shough. "Closing the Circle", by Richard Andrews. "Beyond the Apocalypse", by Greg Taylor. "Flying Saucerers", by The Emperor. "The Temple of Eden", by Philip Coppens. "Shaking Stars", by Geoff Falla. "Death Before Life After Life", by Greg Taylor. "Watson...the Needle! ", by Mike Jay. "The Fear of Psi", by Stephen Braude. "Darkness Over All", by Mike Jay. "The Fog", by The Emperor. "Hungry Ghosts", by Michael Prescott. "Her Sweet Murmur", by Greg Taylor. "Enter the Jaguar", by Mike Jay.